In several recent pieces we have highlighted the risks involved in chasing returns in the high yield credit arena. Our August newsletter took a deep dive into the murky waters of US junk bonds and questioned whether the appetite for the area is sustainable. We also discussed why we believe the area is more vulnerable than its investment grade counterpart (see Degustation or decompression for credit investors? and High yield hunger games). These concerns have been echoed by the latest piece of negative news regarding beleaguered US retailer, Toys R Us, proving junk bond investing is not a matter of simple child’s play. It was revealed this week that the retailer had engaged legal advice for restructuring US$400 million in debt due next year, which also puts the spectre of bankruptcy on the table. The issue underscores the broader structural challenges facing bricks and mortar retailers as the threat from deep discounters such as Walmart and online merchants like Amazon grows. Indeed, the latter has featured heavily in headlines over the past few months following its acquisition and planned price cuts for Whole Foods stores. 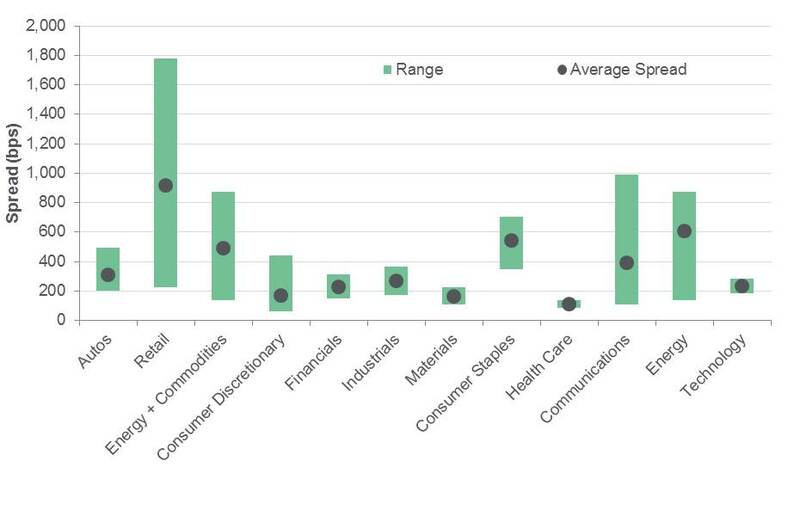 The growing prevalence of e-commerce giants and the structural industry shift raises particular concerns for the US high yield space, where approximately 24% of the US CDX High Yield Index sits in the Consumer Discretionary sector. More than 10% of the sector operates in retail, supermarkets and department stores. This includes well-known operators like JC Penney, Sears and Neiman Marcus. 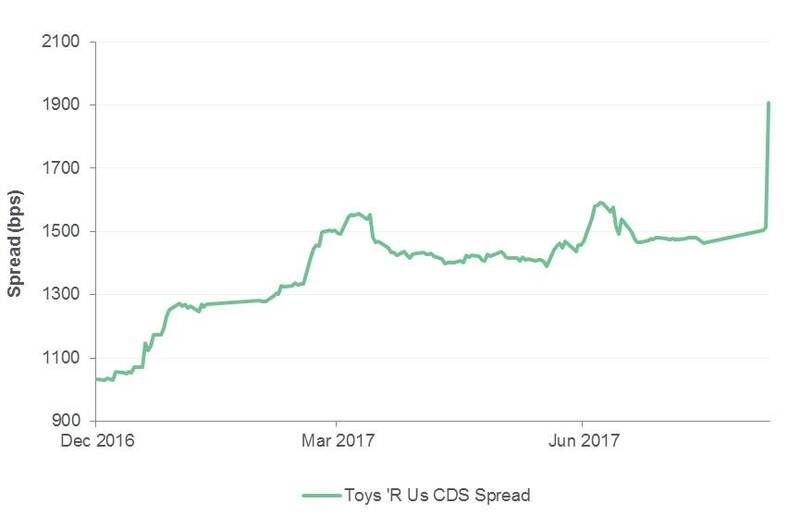 Even before the latest Toys R Us development, the range of spreads in the retail industry was higher than any other, as shown in the chart below. Looking ahead, retailers are entering their most critical time of year as US shoppers prepare for the holiday season. This may explain the timing of the Toys R Us potential decision to restructure its debt. The period typically requires a large investment in inventories to meet expected demand. As such, its restructuring suggests it would prefer to avoid running down cash on its balance sheet and try to avert being pushed to the absolute brink of collapse. The decision may also serve as the canary in the coalmine for other stressed retailers as they face their most intensive part of the working capital cycle. Our view remains that not all credit is created equal. Those investing in the high yield space face many hidden and growing risks. These are being increasingly reflected in key sector vulnerabilities. While retail faces its own problems, challenges continue for the energy and telecommunications sectors. As we witnessed in 2015 after energy prices plummeted, contagion effects stemming from the energy sector caused the broader high yield index to suffer dramatically. With several sectors now facing a raft of issues, the risks are rising that the crowd of high yield investors who have treated the asset class homogenously, will be hit again.